Some days you just want something quick and easy to make for dinner. That’s what you get with today’s Classic Sloppy Joes, comfort food at its best! Ground beef (or your choice of meats or meat substitute) pairs with sauteed vegetables, mild chili-flavored tomato sauce and ketchup to make this childhood favorite. When I was a child, my family and I looked forward to Sloppy Joe night. My mom served it on slices of white bread that sopped up all the juices and helped fill up our tummies. It was a splurge because it was made from mostly meat which was more expensive. Mom had a tight meal budget so it was definitely a special occasion dinner. It is a great way to sneak veggies past your kids. If they are extra picky eaters (like I was), you can grate the vegetables to make them harder to detect. Today I made gluten-free hamburger buns for this meal and was delighted with the results. It took some time for them to rise but then they quickly baked in the oven, turning a beautiful golden brown. One secret to baking gluten-free breads is to get the internal temperature between 206°F and 210°F to be sure they are cooked all the way through. Beautiful gluten-free hamburger buns – look at that crumb! The Artist is looking forward to eating the leftover buns with honey butter, one of his favorites! These are close enough to biscuits for him LOL. The next time you have a busy day and want a quick meal that the whole family will love, give these Classic Sloppy Joes a try. I hope you enjoy them as much as The Artist and I did! 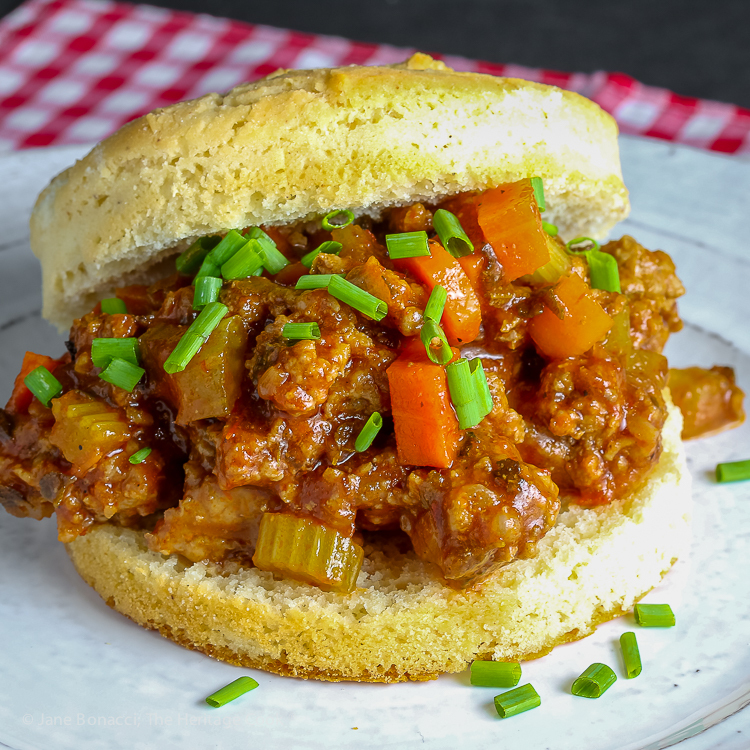 Use your favorite gluten-free hamburger buns, sliced GF bread, or homemade GF buns as the base for these Sloppy Joes. I will be sharing a recipe for the buns in the near future. Heat the oil in a large, deep skillet. Sauté the vegetables on medium-high heat until softened, about 8 minutes, stirring occasionally. Add the beef and cook, breaking up clumps, until fully browned, another 5 to 10 minutes. Stir in the chili sauce, ketchup, and water. Add the vinegar, oregano, chili powder, and salt and pepper. Bring to a boil, reduce heat to medium-low and simmer until slightly thickened and the flavors have blended, about 5 minutes. Taste and adjust seasonings if needed. If you think it needs it, you can add a little brown sugar to balance the flavors. Split the hamburger buns in half horizontally with a serrated knife. Place the bottom half on a plate, add a ladle of the meat mixture and set the other half on top. Serve immediately. « Vanilla Bean Cannoli Cookies and Giveaway!